Hight-Doland Insurance Agency, serving the families of greater Lake Charles, LA with their ongoing community involvement program, debuts a new charity campaign to raise funds in support of Big Brothers Big Sisters of Southwest Louisiana, which helps put local children on the right path in life through positive mentoring. We passionately believe in bettering our community, and the cornerstone of any strong community must be helping children to become valued, productive, responsible members of that community. Hight-Doland Insurance Agency’s new community involvement program which serves families of the greater Lake Charles, LA area has teamed up with Big Brothers Big Sisters of Southwest Louisiana to help provide positive mentoring for local youth. Donations to this worthy cause are now being accepted here. 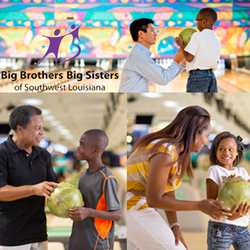 Big Brothers Big Sisters of Southwest Louisiana has been helping to guide the area’s youth for over 30 years, providing kids facing adversity with strong, enduring, professionally supported one-on-one relationships that help to positively impact and change their lives for the better. Their programs have been proven to enhance educational success, help kids to avoid risky behaviors and inspire confidence and greater aspirations. Over 300 local children are served annually by Big Brothers Big Sisters and its volunteer mentors through one-on-one mentoring, both in the community and in the local schools. The agency’s caring team is hard at work promoting the initiative through social media and an email awareness campaign, even featuring Big Brothers Big Sisters in their monthly electronic and print magazine. Our Hometown magazine, which is delivered to thousands of households in Lake Charles and surrounding communities, reserves a full page to showcase the campaign for Big Brothers Big Sisters. The current issue may be viewed at: http://www.hightdolandagency.com/Our-Hometown-Magazine_41. Readers who would like to join Hight-Doland in supporting Big Brothers Big Sisters may do so here, and are encouraged to share the page with those in their own circles of influence. Contributors may be acknowledged for their donations in the agency’s monthly magazine. The agency itself has pledged to donate $10 to Big Brothers Big Sisters for each and every referral they receive for an insurance quote, with no purchase necessary. Hight-Doland has demonstrated their devotion to the community by the establishment of a master charity program, of which the current campaign is part. “We are fully committed to assisting those in need in our community, and will be selecting a new group, family or individual to support every two to three months,” promised Hight. Information on past campaigns may be found at: http://www.hightdolandagency.com/community-cause. To learn more about the agency, please visit: http://www.hightdolandagency.com/. Serving families from offices in Lake Charles, LA, Hight-Doland is an award-winning, full service insurance and financial services provider committed to bringing local people an agency which understands their needs. Pat Hight and his team of dedicated professionals work with carriers to assemble a variety of products and services which will ensure their clients’ peace of mind. From all of the products a typical consumer needs (home, auto, boat, ATV, etc. ), to financial planning for long-term success, Hight-Doland delivers consistently superior service. Their caring experts may be reached by calling 337-474-2020.